This Sunday, our readings call our attention to the trials and tribulations of the prophet. A prophet is someone called by God to speak God's truth, especially among the prophet's own people. Regardless of whether people listen, a prophet remains faithful to his or her calling when "They shall know a prophet has been among them." In the words of St. Therese of Calcutta, "God has not called me to be successful. He has called me to be faithful." In our first reading (Ezekiel 2:2-5), Ezekiel tells us it is the Holy Spirit who has entered into him that enables him to speak on behalf of God and sends him on his mission among his own people, a "rebellious house". God tells him that whether or not they listen to him, "They shall know that a prophet has been among them." As the LORD spoke to me, the spirit entered into me and set me on my feet, and I heard the one who was speaking say to me: Son of man, I am sending you to the Israelites, rebels who have rebelled against me; they and their ancestors have revolted against me to this very day. Hard of face and obstinate of heart are they to whom I am sending you. But you shall say to them: Thus says the LORD GOD! And whether they heed or resist-for they are a rebellious house - they shall know that a prophet has been among them. In today's Gospel (Mark 6:1-6), Jesus, the ultimate prophet, returned to his home town and taught in the temple. They were "astonished" (not in a good way) at his words and deeds. "Where did this man get all this?" they asked. Even among his own kinfolk, Jesus was not accepted. In last Sunday's readings, we learned that faith is a key to the mercy of Jesus. That point is made again in today's Gospel as their lack of faith prevented Jesus from performing "any might deeds there." Jesus departed from there and came to his native place, accompanied by his disciples. 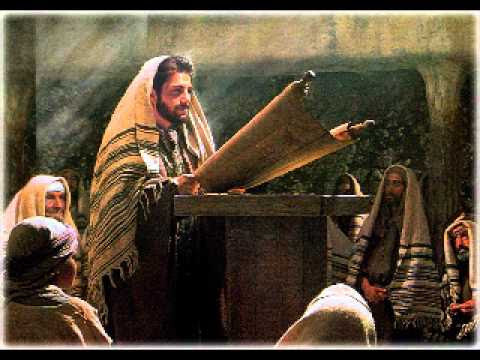 When the sabbath came he began to teach in the synagogue, and many who heard him were astonished. They said, "Where did this man get all this? What kind of wisdom has been given him? What mighty deeds are wrought by his hands! Is he not the carpenter, the son of Mary, and the brother of James and Joses and Judas and Simon? And are not his sisters here with us?" And they took offense at him. Jesus said to them, "A prophet is not without honor except in his native place and among his own kin and in his own house." So he was not able to perform any mighty deed there, apart from curing a few sick people by laying his hands on them. He was amazed at their lack of faith. In our Epistle reading (2 Corinthians 12:7-10), St. Paul instructs us that is precisely through our weaknesses and our afflictions that "the power of Christ may dwell" within us. Brothers and sisters: That I, Paul, might not become too elated, because of the abundance of the revelations, a thorn in the flesh was given to me, an angel of Satan, to beat me, to keep me from being too elated. Three times I begged the Lord about this, that it might leave me, but he said to me, "My grace is sufficient for you, for power is made perfect in weakness." I will rather boast most gladly of my weaknesses, in order that the power of Christ may dwell with me. Therefore, I am content with weaknesses, insults, hardships, persecutions, and constraints, for the sake of Christ; for when I am weak, then I am strong. In case we are thinking that stories about prophets of old do not concern us directly, be reminded that through our own baptism, we are called to share in Christ's ministry as priest, prophet and king. Regardless of each of our individual callings and charisms, we are each called to be a prophet - to speak God's truth to those around us, especially among our own kind and within our own family. It is not up to us as to whether people listen. God wants us to be faithful to his truth and to speak it unabashedly. We are successful when they know that a prophet has been among them. "My grace is sufficient for you."